Upon successful completion of the NKE you will become a CPHR Candidate and can represent yourself as such. b) the work experience must be at the professional level in HR and can be achieved either before or after you write the NKE, however, you have a total of 10 years from the time you submit. Upon successful completion of the NKE waiver you will become a CPHR Candidate and can represent yourself as such. 2) the work experience must be at the professional level in HR and can be achieved either before or after you write the NKE, however, you have a total of 10 years from the time you submit. *At present, there are no accredited programs in Saskatchewan. 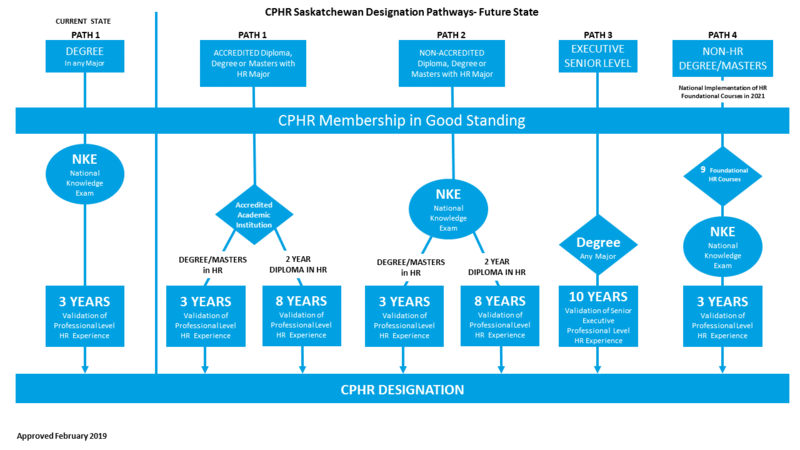 In the coming months, CPHR Saskatchewan will commence this work with academic institutions that offer HR programs in the province of Saskatchewan to determine their interest in pursuing accreditation. If academic institutions confirm interest, work will commence and the details (e.g., timeframe) will be established, as both parties work together. For more information on the Executive Senior Level Professional Experience requirement, please contact Nicole Norton Scott via email. Currently all the details of the HR Functional Courses are being worked out nationally. We will communicate once finalized. Please note that you do not need to follow these steps in order. However, one will not be considered as a CPHR Candidate until the NKE exam is passed or an NKE waiver has been approved. Learn what happens after you get your designation here!